Frederick was born on 17 August 1877 (birth certificate number 1877/5995) in Te Kopuru in the northern Kaipara region. We do not have any information on his childhood or education but we could assume it would have been the same as his siblings and other children of the time and area. In 1899 aged 22, Frederick marries Isabella Maynard nee Russell (32), the daughter of his father’s half sister Mary Ann and her husband James Thomas Russell (Marriage Certificate number 1899/15052) at the Registrar’s Office in Dargaville. Frederick is listed as a Labourer. This is Isabella’s second marriage her first husband died in 1897. She had three children from this first marriage. Frederick and Isabella had six children Frederick Edmond (1899), William Henry (1901), Harold Vane (1902), Irene Mavis (1904), Ida Maude (1906) and Freda Edna (1908). In the 1905-1906, 1911, 1914 and 1919 Electoral Rolls, Frederick is listed as living in Aratapu, Kaipara and his occupation is listed as a rafter. On the birth certificates of his children he is listed as a sailor, seaman, mariner, mill-hand and master mariner. At the age of 40 he would have only been a reserve and never called up. We see that he is living still in the Kaipara area, and like his father and grandfather he was working on the water. Frederick was listed as a Waterside Worker and living at 20 Summer Street, Ponsonby, Auckland – at some stage they have moved from the Kaipara to Auckland. On 15 August 1920 Frederick dies of Pneumonia – for about 5 days and cardiac failure, at the Auckland Hospital, another victim to the “Spanish flue”. (Death certificate number 1920/2204 aged only 43. His surviving children aged between 11 and 20 years old. 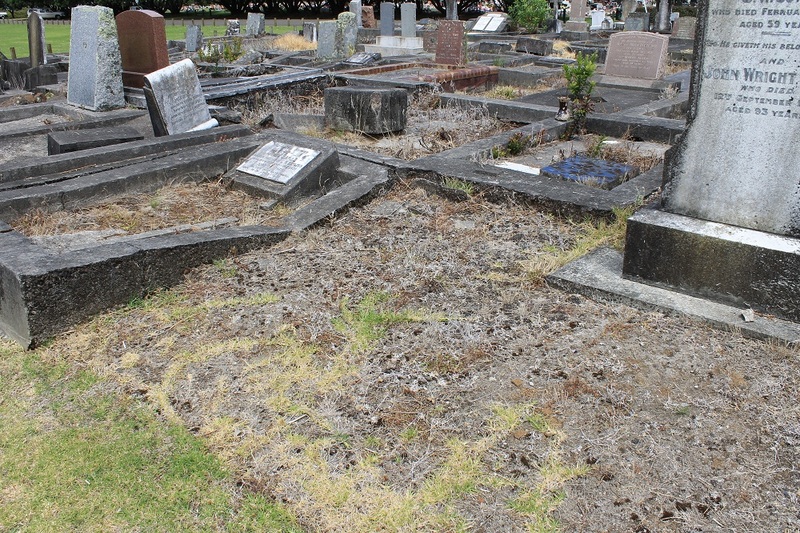 Grave Site – Waikaraka Cemetery. He is buried at the Waikaraka Cemetery Area 2 Block Y Lot No 45A, sadly the headstone no longer exists.